What would history be like if fortunes of Rome and China are reversed? 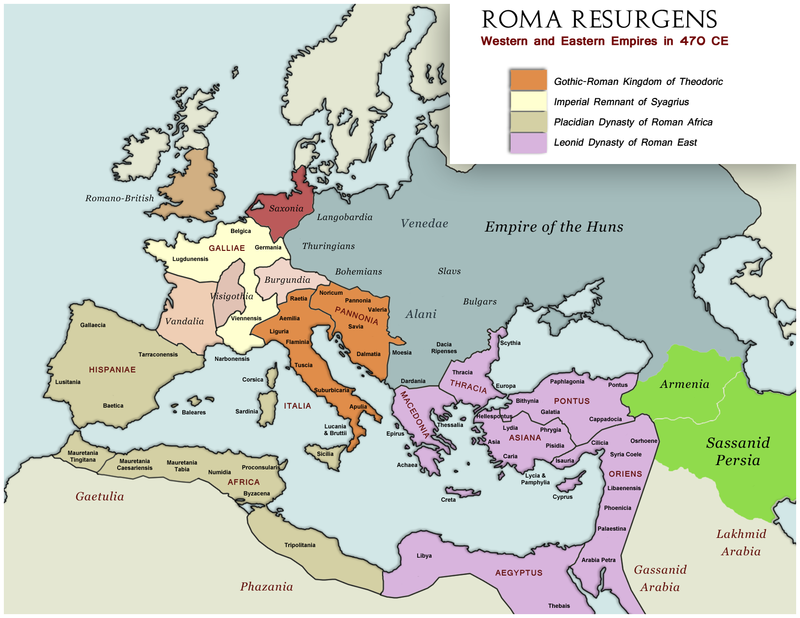 What if Roman Empire solidified in the Late Antiquity, defeated usupers and invaders alike, and became rich but ultra-conservative, self-righteous and inward-looking empire exploited by Chinese traders, explorers and diplomats? What if Chinese Empire fell to Turks in the 6th century and never united again, and its constituent parts went their own ways, ushering a new age of “Hundred Schools of Thought“? In Roma Resurgens, Christianity is purged out of the Empire, while medieval Chinese kingdoms became largely Christianized by Nestorian missionaries. 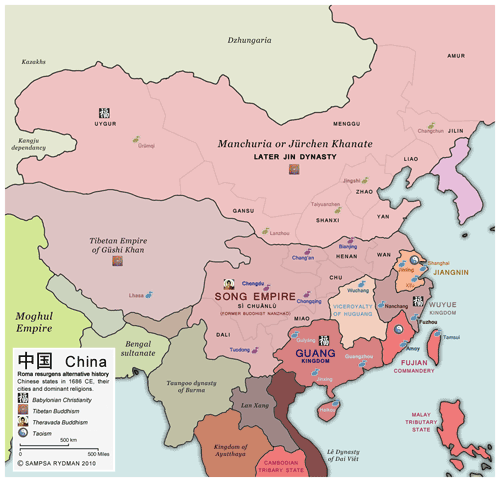 Kongfuzianism is discredited after the fall of the Middle Kingdom and replaced by rapidly advancing Buddhism and Christianity. In the West, Neoplatonism is canonized as the official philosophy and sacrifice to the divine emperor is never abolished. Powerful but utterly stagnated, distrustful Rome is unable to compete with dynamic Chinese kingdoms and unwilling to adopt new ideas or technologies. In the 17th century, its last and most illustrious Lucidian Dynasty gives in to nothern barbarian overlords, and the Eternal Empire becomes mere pawn to colonialist Chinese states willing to enter Mediterranean markets with their superior products, backed with gunpowder and rockets. Old-fashioned Roman legions are bombarded to smithereens when trying to resist. What if Constantine was defeated by Maxentius at the Milvian Bridge, and his body drowned in Tiber? The fate of the Christian empire was decided in a single battle. In spite of its vivid social mobility, foreign accommodation and technological innovation, Roman Empire was in effect an ultra-conservative state fixated to the glorious past. If Roman empire had bounced back and recovered, Vulgar Latin would have developed into a common Romance tongue. In 1839 the refusal by Roman imperial government to import Chinese opium resulted in the First War between Guang Kingdom and Rome. Guang forces occupied Gibraltar, renamed 香港, and later formally ceded to Guang under the treaty of Alexandria. Later, more territory was ceded to Guang, Fujian and Jiangnin under Da Qin Commandery. Collated from the World Encyclopedia of Aemilius Neolivius and De Imperatoribus Romanis by Lucretius Pompeianus. Europe during the Luminous Roman Empire (1368-1644), resembling the Ming Dynasty. The world in 1686 CE, better known as year 4382 in Chinese Calendar. The Roman Empire was born from civil war. The old Republic that had unified most of the Mediterranean under Roman rule was severely weakened by political strife and contests of power-hungry generals. Transition from republic to empire started with Julius Caesar’s appointment as perpetual dictator in 710 AUC (44 BC) and was complete in 727 AUC (27 BC) when the Roman Senate granted his adopted son the honorific title of Augustus. In theory, Roman Empire was not a legal monarchy but retained the constitutional framework of the Republic. During the Principate era the autocracy of the Emperor was masked by forms and conventions of oligarchic self-rule inherited from the Republic. Initially, the legal theory implied the ‘first citizen’ had to earn his extraordinary position by merit in the style that Augustus himself had gained. Later, the honours and magistracies that belonged to the Emperor were to become imperial titles and yielded without discretion to designated heirs. Imperial propaganda developed a paternalistic ideology, presenting the Emperor as the very incarnation of all virtues attributed to the ideal ruler, such as clemency, justice and generosity. The Emperor was to be source of justice, public works, benefaction, entertainment (in forms of public games and festivals) and piety. As the high priest, Pontifex Maximus, the Emperor was also supreme authority in the field of Roman religion and guarantor of Pax Deorum, Peace of Gods. An Emperor who did not live up to these expectations could be seen as having lost the providence of Gods – and deposed. The Principate was the first imperial era of Rome, preceded by the civil wars of the Late Republic and succeeded by the Warring Empires during the Crisis of the Third Century. It separates into two periods: the Julio-Claudian dynasty, which originated from Augustus and lasted until the murder of Nero Agrippa1 in 95 CE, and the Adoptive (Antonine) Dynasty, which ruled the Roman Empire until the death of Pertinax in 193 CE. Spanning over three centuries, the Principate era is considered a golden age in Roman history. Although there were serious wars against Germans, Dacians and Parthians, it was remembered as the era of Pax Romana, the Roman peace. To this day, majority of ethnic groups in the Mediterranean refer to itself as the “Roman people” or Romanians, and speak Romance language. Rome made great advances in many areas of the arts and sciences: Cement, glass blowing, bookbinding, hydraulic mining, water mills, glossed pottery, lateen sails, screw press and soap. 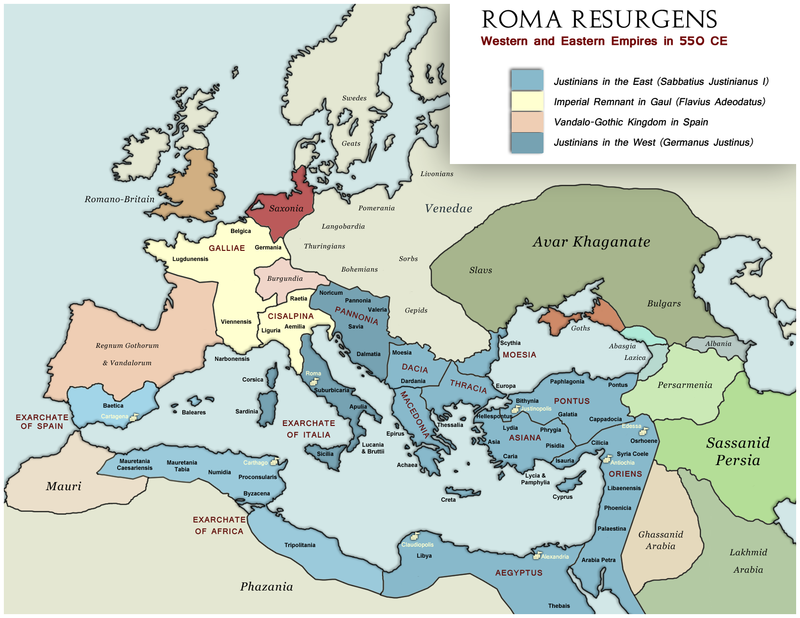 Emperors consolidated and extended the Roman Empire by pacifying Germania and Britannia, pushing barbarian tribes far into the forests of central Europe and making Near Eastern kingdoms their clients. This enabled the first opening of trading connections between Rome and China, the Silk Road. Popular generals Vespasianus and Trajanus expanded their conquests across the Near East, annexing Mesopotamia and Armenia and establishing trade relations with India. Nevertheless, failing birthrates and predatory land acquisitions by elite families gradually drained the tax base. The problem was made worse by the outbreak of the Antonine Plague (165-180 CE), which decimated the army and killed as much as one-third of the population in some areas. 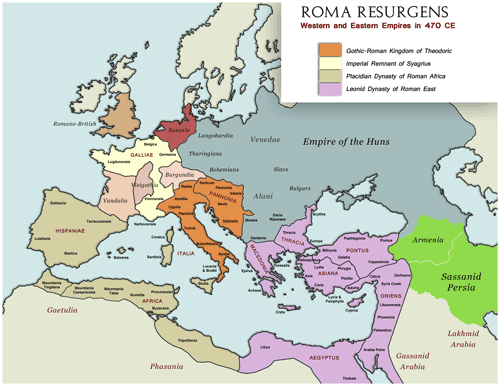 In 193 CE, the usurper Septimius Severus founded the short-lived Severan Dynasty2 and started a program of military and economic reforms, including extending full Roman citizenship to all free inhabitants of the empire. In spite of this, the Severan dynasty proved inherently unstable and declined amidst invasions and internal feuding between imperial consorts, empress dowagers and other family members. Instability brought about chaos and uprisings, ushering an era of warlords – so-called “barracks emperors”. 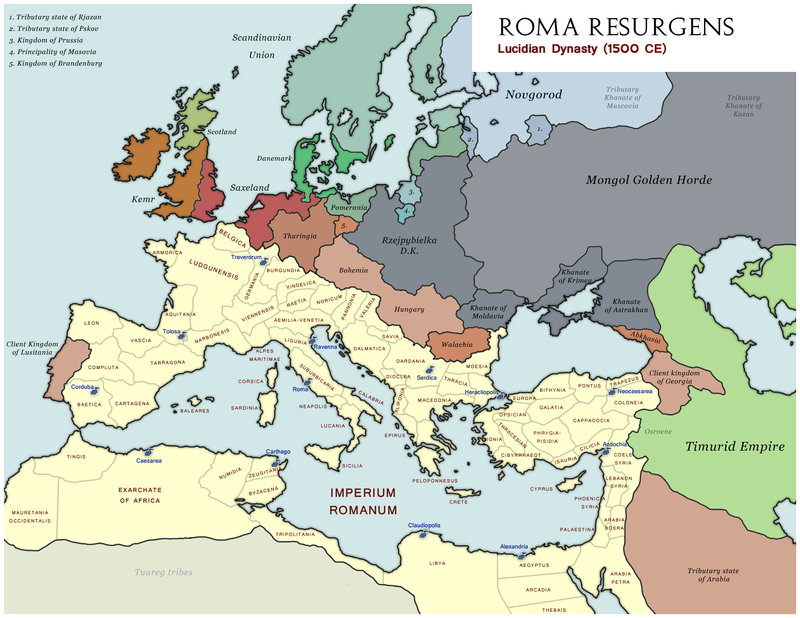 Chronic instability of the imperial office and the near constant state of civil war and insurrection threatened to destroy the Roman Empire from within and left it vulnerable to attack from without. Provincials became victims of frequent raids by foreign tribes, such as the Carpi, Goths, Vandals and Alemanni along Rhine and Danube rivers, as well as attacks from Sassanid Persia. In the ensuing turmoil, three powers tried to gain predominance in the Period of the Warring Empires: Gallic empire in the West, Palmyrene empire in the East and the Central empire around Italy and Africa. Pandemics, foreign invasions, economic depression and repeated wars of succession tormented the Roman world throughout the period of the Warring Empires. It was characterized by a gradual decentralization of the state and an increase in the importance of the army over traditional aristocracy. The crisis began with the assassination of emperor Alexander Severus at the hands of his own troops, initiating a fifty-year period in which 25 claimants to the title of Emperor, mostly prominent generals, assumed imperial power over all or part of the Empire. By 258 CE, the Empire split into three competing states. Roman powers abandoned several provinces along the Danube: Marcomannia, Dacia, Moesia and Thracia were all lost to foreign invaders in 240-260 CE. The tripartite situation remained stable at first, but when the central empire proper regained its strength under the Valerian Dynasty, they reunified the Empire. Capture of Moesia, Thracia and Asia (263) were followed by destruction of the Palmyrene Empire (270) and overthrow of the Gallic Empire by general Probus in 280 CE. Although relatively short, the period of warring empires resulted in profound changes in the institutions, society, economic life, and religion. Plague broke out again, raging from 251 to 270 CE and weakening social bonds and traditional religious cults. Widespread civil unrest also disrupted Rome’s extensive internal trade network. Large landowners, no longer able to export successfully their crops over long distances, began producing food for subsistence and local barter. Import of manufactured goods diminished as local self-sufficient economies grew, contributing to separatism and growing disdain for Roman tax collectors. In spite of this, the era of Warring Empires was highly romanticised in later Roman history. The period has been celebrated and popularised in Roman operas, folk stories and novels. The best known of these is undoubtedly the Aurelian Romance3, a fictional account of the period written by Ludovicus Julianus in the 14th century. 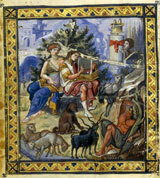 The authoritative 3th century historical record of the era is Imperial Histories4 by Aurelius Florianus, much used by later writers. The dynasty that brought the era of Warring Empires to an end was founded by Publius Licinius Valerianus. Unlike the majority of pretenders of his age, he was of a noble and traditional senatorial family. With his son and heir Gallienus he reorganised the Roman army by creating large mobile reserves from mounted elements of the legions. Persian-adopted heavy cavalry, called cataphracts, became the steel nucleus of the new army, which proved successful in the field against Goths, Alemanni and rival Roman states. The word for this era, Dominate, is derived from the Latin dominus (lord, master): Emperors became to be worshipped as living gods. Valerians sought to consolidate their hold on power by adopting popular generals who would otherwise be usurpers in waiting. Most of them were natives of Illyria, a harsh and mountainous country that produced some of Rome’s best soldiers at the time. They also tried to revive those offices and magistracies that had lapsed during the Principate and endorsed a new state cult devoted to the Unconquerable Sun, Sol Invictus. Neoplatonism5 became official state ideology. Dissident cults, such as Christians, were subject to sporadic persecution. In 293 CE, emperor Valerius Diocles Jovius confirmed the system of diarchy or collegial rule, making his aide Maximianus Herculius his equal co-emperor and dividing the Roman Empire formally into western and eastern spheres of power, with Mediolanum and Nicomedia as new imperial capitals. Jovius tried to halt the growing decentralization of the Roman world by reorganizing the whole Empire into four Praetorian prefectures and absolving local prerogatives and legislative relics, such as the leagues of Greek cities and the preferential status of Italy in the Empire. Not every reform bore fruit: imperial ambitions to end rampant inflation by edicts controlling wages and prices proved disastrous to the economy. The division of imperial power was ultimately a non-working solution and propagated civil war of unseen proportions. Although providing a brief period of unity to the whole Roman world, the Valerian emperors could not contain uprisings and invasions after the devastating War of the Eight Caesars (306-311)6. Harsh taxation and religious persecution had already spawned dangerous revolts in Egypt, which had substantial Christian minority, leading many Christians to flee south to the kingdom of Aksum7. Most of Germania and Britannia were lost to barbarians. Huns and Goths laid waste to the Danube provinces. At the same time, Rome was losing control of its eastern dependencies to Sassanid Persia, Rome’s most dangerous rival. To contain these dire threats, weak emperor Valerius Jovianus adopted two of his most accomplished Illyrian generals, Valentinianus and his brother Valens, founders of the Valentinian Dynasty. Militaristic authorities and crises plagued the late Valentinian Dynasty throughout its later years of existence. Rebellions and usurpations abounded; real power shifted into the hands of courtiers, consorts and barbarian generals. By the end of the fourth century CE, majority of the Roman army was composed of barbarian federates and foreign mercenaries. Western and Eastern parts of the Empire were often at war with each other. In 392, general Maximus usurped power in the west. He was toppled by his rival, vandal general Stilicho, who ordered the strangulation of the reinstated but retarded emperor Valentinianus II. Last of the Valentinians, child-emperor Valentinianus III, ruled nominally the eastern provinces until his forced abdication in 420 CE. 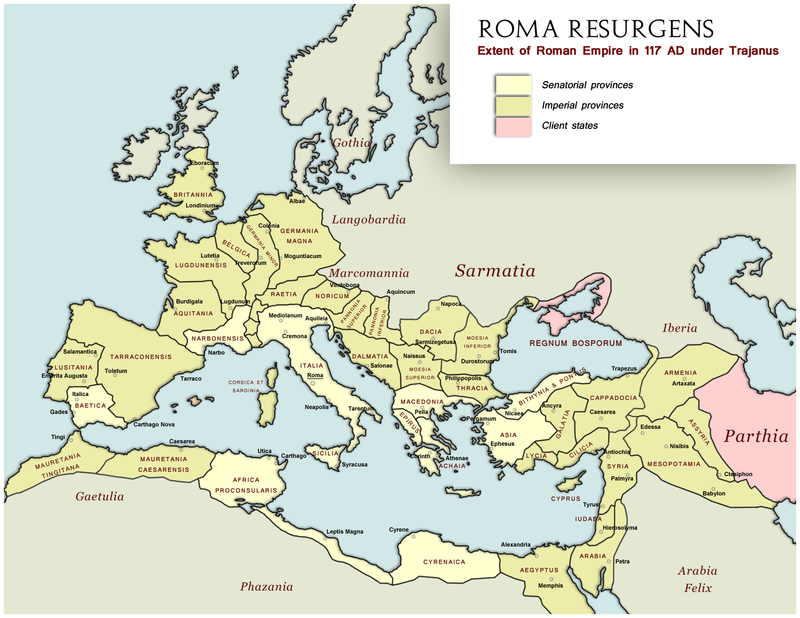 The whole Roman Empire sundered into Imperial Remnants and partially romanised barbarian kingdoms. 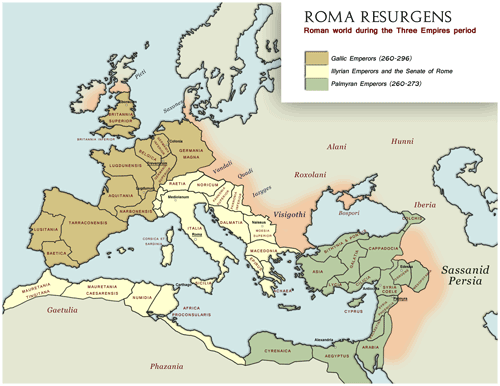 Taking advantage of civil wars within the Empire, non-Roman ethnic groups took over much of the Western Roman Empire. In 340 CE, alliance of Angles, Saxons and Danes invaded Germania and Britain. 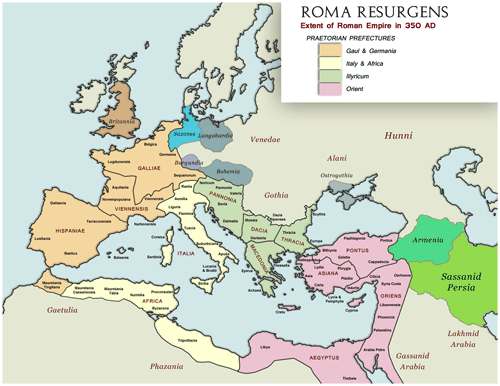 Other Germanic peoples, romanised to some extent, peacefully resettled depopulated areas in Italy and Gaul. After 420, a plethora of short-lived non-Roman dynasties came to rule the whole or parts of Western Rome in the 5th and 6th centuries. The Goths entered Roman territory in 376 as refugees from the Huns and soon became a major player in domestic politics. Tolerated by Romans on condition that they defend the Danube frontier, they eventually rose up against the Imperial Remnants and took possession of Italy and Rome in 470 CE, proclaiming the Valagothic Kingdom. It was one of the most devastating events in Roman history, causing close to 170 years of division. Though filled with war and political disunity, the Migration Era was also a time of flourishing in the arts and culture, advancement in technology, and the spread of Christianity and Manichaeism. Distinctive Hellenic Christianity matured during this time and shaped by the western and eastern empires alike: Christ was adapted to the long list of Gods and Goddesses that had protected the emperors. Romanisation accelerated among the non-Roman arrivals in the west and among the aboriginal tribesmen in the south. Many western Romans also immigrated to the Greek-speaking east. This process was also accompanied by the increasing popularity of Christianity. With invention of the stirrup and horseshoe, not only were cavalry tactics improved immensely, but heavily armed Roman cavalry became the norm in this age. There were also notable advances in medicine, astronomy, mathematics and cartography. 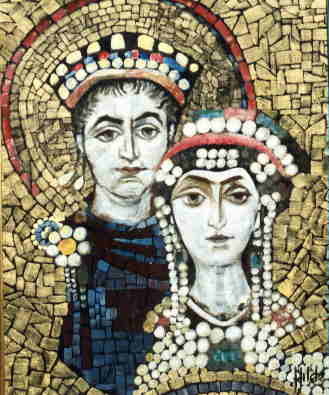 The Justinian Dynasty oversaw a period of recovery and reunification of the Roman territories. It was founded in 518 CE by Christian palatial officer Flavius Justinus, originally a peasant from Illyria. 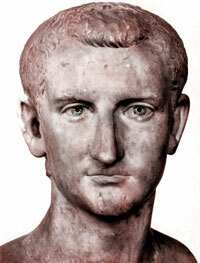 Through his position as the commander of the imperial guards and lavish bribery, he secured the purple upon the death of eastern emperor Anastasius Dicorus. The dynasty held its capital at Nicomedia, also known during Justinians as Augusteia Justinopolis. His adoptive son Sabbatius Justinianus I inherited a good army and vast wealth generated by frugal policies of his father, and embarked on a campaign of reconquest. The western campaign began in 533, as Justinian sent his general Belisarius to reclaim the former dioceses of Africa and Hispania from the rival Placidian Dynasty with an army of 15,000 men. Success came with surprising ease. In Valagothic Italy, the deaths of Theoderic, Athalaric and his daughter Amalasuntha had left the murderer Theodahad on the throne despite his weakened authority. In 535, a small Roman expedition sent to Dalmatia met with easy success, but the Goths soon stiffened their resistance, and victory did not come until 540, when Belisarius captured Ravenna and Mediolanum. Justinianus was a man of furious energy. He simplified administration and imposed a series of large-scale legal reforms that resulted in the new Corpus Juris Civilis, a collection of laws that came to be referred to as “Codex Justinianus”. He ordered land redistribution, and lowered taxes on both farmers and merchants, yet the increasingly efficient bureaucracy brought in adequate revenues. Coinage was standardized and re-unified, army was improved and fortifications expanded. He was also indulgent to both Christianity and Mithraism, even having a group of Christian advisers involved in his programme for the country’s unification. By this time, the dominant political force to Rome’s north-east was the Avar Khaganate, which had subjugated Turkic Bolgars, Huns and Slavs. The empire responded by setting various Turkic groups against one another and all of them against the Avars. There were other campaigns against the Persians. Demise of the Justinian Dynasty after emperor Mauricius in 602 was attributed to the government’s tyrannical demands on the people, who bore the crushing burden of taxes, billeting and compulsory labor. Its resources were depleted in costly military operations and it was finally disintegrated through a combination of military revolt, disloyalty and assassination, like so many Roman imperial dynasties before. After Mauricius’ murder by Phocas, Persian shah Khorsau used the pretext to renew war with Rome. Phocas, an unpopular and tyrannical ruler, was the target of a number of senate-led plots. In 608, the Exarch of Africa and his son, both named Heraclius, began a revolt against Phocas. Two years later Phocas was defeated, and the younger Heraclius took the throne. The Heraclian Dynasty lasted until 907 and became one of the most famous dynasties in the entire history of the empire. Heraclian Romania may well have become richest and most sophisticated state in the world of its time. The dynasty presided over a period of cultural exuberance, and the brilliance of its art and ceramics has never been surpassed. Heraclians ruled at first from Carthage, but the imperial capital was later transferred back to Rome and then to Byzantium, renamed Heracliopolis. Following the ascension of Heraclius, the Sassanid advance pushed deep into Asia Minor. Over the following decade, Persians were able to conquer Palestine and Egypt, while Avars took advantage of the situation to overrun the Balkans. Heraclius evoked Isis, Sol Invictus and Christ, and led personally the counter-offensive that saved Byzantium from an Avar siege in 626. Then he allied himself with the Gökturks of the Western Turkic Khaganate, who invaded Persian Transcaucasia. Heraclius then brought his army to Armenia and attacked Persian rear. The main Sassanid force was destroyed at Niniveh in 627. After Heraclius’ victory over the Persian empire left it in disarray which it never recovered. In 633 the emerging Islamic state slowly devoured the Persians. Romans were nearly defeated by Arabs at Damascus. War continued until 678, when a fifty-year truce was signed between the empire and the caliphate. 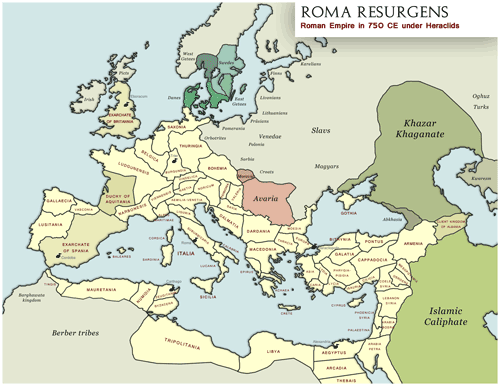 In Roman history, the Heraclian dynasty was largely a period of progress and stability. Like the previous Justinian dynasty, Heraclians maintained a civil service system of salaried professionals. This civil order was undermined by the rise of regional military governors known as exarchs during the 9th century. There was a rich variety of historical literature compiled by scholars, as well as encyclopaedias and books on geography. Notable innovations during the Heraclian era include woodblock printing, improvements in cartography and the application of hydraulics to power air conditioning fans. Several reasons led to the proscriptions, among them the accumulated wealth of the monasteries, which was badly needed to counter huge government deficit. Another reason was the rise of the Neohellenism and philosophers who wrote manifests against the foreign religion, believing its egalitarianism destroyed the social system of duty and rights of the upper and lower classes. While native polytheism, philosophy and mystery cults experienced a sudden revival, Christianity never regained its influence. From about 860 the Heraclian dynasty began to decline due to a series of rebellions within the empire itself, and in the previously subject kingdoms of Saxonia, Thuringia and Bohemia. 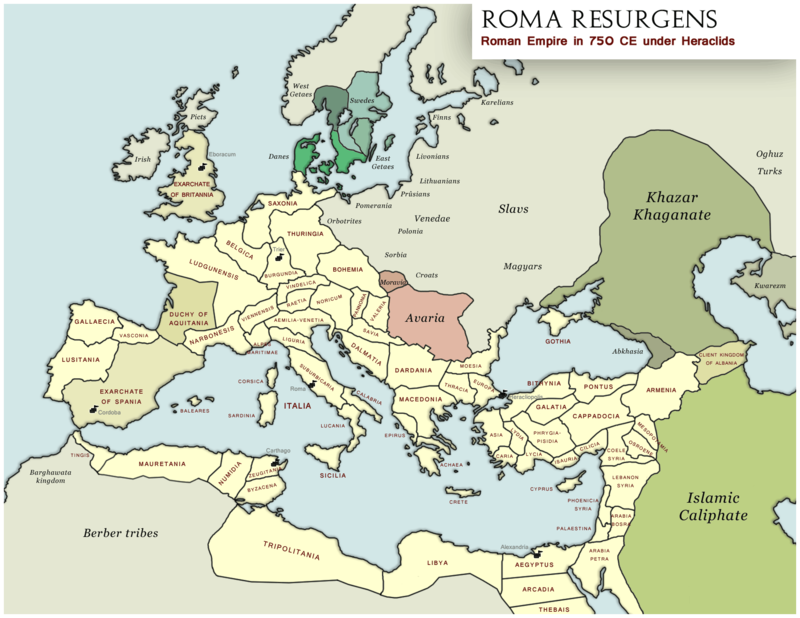 Last ruler of the reunified empire, Romulus III Porphyrogenitus, was deposed by his military governor Damianus. Five regimes succeeded one another rapidly in control of the old imperial heartlands in Italy and Egypt. Ten more stable regimes occupied sections of the western and northern Romania. In 960, the Isaurian dynasty (960-1279) gained power over most of eastern Romania and established its capital in Alexandria, starting a period of economic prosperity. Western Romania was dominated by a succession of Germanic dynasties, while Empire of Two Sicilies took over Mediterranean islands. Eastern empire experienced a period of great technological development which can be explained in part by the military pressure. This included the use of gunpowder weapons, which played a large role in the Eastern Roman naval victories against the Arabs in the Battle of the Red Sea and the rival Angeloi dynasty in the Battle of Messina. The Islamic Caliphate was defeated by the Mongols in 1258, who then proceeded to defeat the Eastern Roman Empire in a long and bloody war. With Mongols came the 14th century plague, dubbed “Black Death”, which is estimated to have killed one third of the population in Romania. Nero Agrippa Caesar, fictitious grandchild of Nero Julius Caesar (not the historical emperor Nero) by Claudia Octavia, daughter of Claudius. To legalise his rule, Septimius Severus retroactively adopted himself to the preceding Antonine family, giving justification to the notion of Severans as “later Antonines”. Thus, the period from Antoninus Pius to Severus Alexander is called “the Antonine Age” in many histories. Fictional work resembling the Romance of the Three Kingdoms. A lost historical work known in our world as the hypothetical Kaisergeschichte, covering the time from Augustus to c. 337 CE. It was the common source for authors like Aurelius Victor, Eutropius, Jerome and the anonymous or unknown authors of Epitome de Caesaribus and Historia Augusta. Neoplatonism is a religious and mystical philosophy that took shape in the 3rd century CE, founded by Plotinus and Ammonius Saccas. War of the Eight Caesars is a fictional civil war for power among various designated emperors, co-emperors and pretenders. It resembles the power struggles of the Tetrarchs in our history, but differs in outcome. The eponymous eight Caesars are Maximianus, Galerius, Licinius, Severus, Constantinus, Domitianus, Alexander and Maxentius. In the end, Maximianus and Galerius are dead, Licinius, Severus, Constantinus, Domitianus and Alexander are all defeated by Maxentius and the Empire is divided between him and Maximinus Daia. Without Constantine, the Roman Empire stays officially pagan. Kingdom of Aksum, also known as Axumite Kingdom, was a maritime trading empire and important ally of Rome located in north-eastern Africa and southern Arabian peninsula. It converted to Coptic Christianity in 326 CE under king Ezana II. In Roma Resurgens Aksum eventually becomes the most important centre of Christian thought and dominating empire in Africa. The Four Christian Persecutions in Rome was the wholesale suppression of Christianity carried out on four occasions from the third through the tenth century. The First was the Decian Persecution of 250-261. A decree was issued requiring public sacrifice, a formality equivalent to a testimonial of allegiance to the Emperor and the established order. Emperor Decius authorized roving commissions visiting the cities and villages to supervise the execution of the sacrifices and to deliver written certificates to all citizens who performed them. Christians were often given opportunities to avoid further punishment by publicly offering sacrifices or burning incense to Roman gods, and were accused by the Romans of impiety when they refused. Refusal was punished by arrest, imprisonment, torture, and executions. The Second and Third persecutions were decreed by emperors Diocletianus, Galerius and Maximinus Daia at the end of the third and beginning of the fourth century. They banned Christian practices and ordered the imprisonment of Christian clergy. The last persecution in 845-950 called for “abolishment of Christianity”. Christian images were destroyed and their clergy returned to lay life. I was looking for the Third Reich alt-hist by Mr. Rydman when I stumbled across this page. And I must say, wow! This is a really amazing story. I never read anything like it. I very much like the Rome / China reverse history. It’s really interesting to look at things from this totally different angle. Is there any chance that there will be expansions on the existing material any time soon? Does Mr. Rydman plan to expand the story beyond ~1680, to sketch out a future history of Chinese supremacy and the eventual fall of the Roman Empire? Or is it supposed to end around that time, leaving it to the reader to imagine how things could progress?